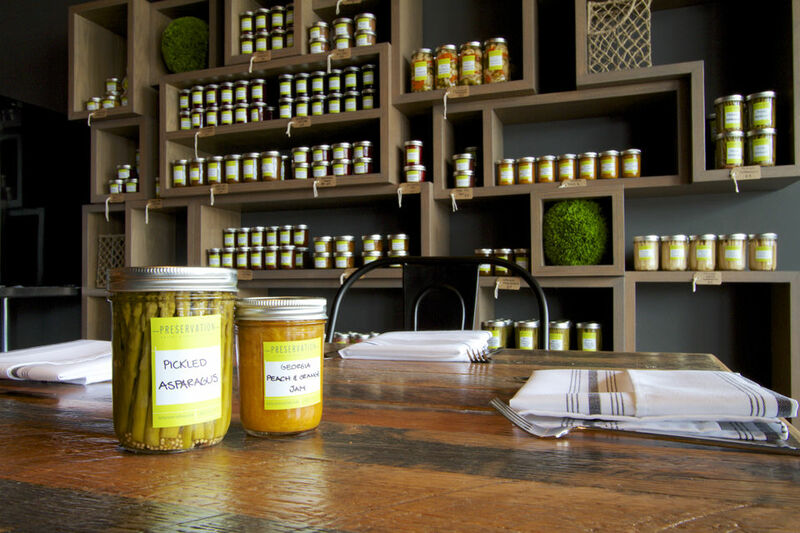 Preservation is a brand new restaurant located in a strip mall in Sunny Isles. They had me at Cured, Pickled, Smoked. They pulled me in further with each and every bite. I went three days in a row. And I've been back a couple more times since. I've left each visit impressed with their passion for doing things the right way. Almost everything is made in house including their breads, charcuterie, jams, jellies, pickles and preserves. Everything is fresh with very clean flavors. There are noticeable refined skills and finesse in each dish which is no surprise since they have trained under Thomas Keller, John Besh, Michael Mina, Jean-George and Gabriel Fenton. They are young and inexperienced restaurant owners but there is talent in the kitchen. This is a place to keep your eye on as it evolves. They continue to tweak the menu and offer daily specials that have been excellent thus far. This is a chef and ingredient driven place that Miami food fans should embrace. Chef/Owner Ryan Harrison was born and raised in New Jersey and has been involved in the industry since he was fourteen. After spending nine years working in the "front of the house" he enrolled at The Culinary Institute of America, Hyde Park, NY. After graduating from The CIA, Ryan and partner Nicole went on to travel the East Coast exploring various career paths such as operating the Vendy Award Winning “Smoke Truck”, a gastro-pub in South Philadelphia, to a farm just outside of Moorestown, New Jersey. Ryan spent the majority of his life learning farming from his mother Gina a/k/a Jersey Gina and business skills from his father Don who is an attorney. Ryan attributes Chef John Besh for playing a huge role in sculpting his style of cuisine while working at one of my favorites restaurants in New Orleans, Restaurant August. He also speaks highly of the time he spent being trained by one of the best chefs in Miami, Gabriel Fenton while working the line at Bourbon Steak. Ryan also learned a tremendous amount during his stint at Ela in Philadelphia where he trained under Chef Jason Cichonski who will be competing on Top Chef 11 in October and Chef de Cuisine Billy Riddel. Ryan's right-hand man is sous chef Adam Alfaqih. Adam was born and raised in Jordan where farm to table wasn't a catch phrase but a way of life. After his family moved to New Jersey Adam spent numerous hours in the kitchen with his grandmother learning to cook the traditional Middle Eastern food he missed. After graduating from The Culinary Institute of America, Hyde Park, Adam went on to train under Thomas Keller, Michael Mina and Gabriel Fenton. Pastry Chef Francisco Migoya was an inspirational force while in culinary school. Ryan's partner Nicole Richaud was born and raised in Mexico City, Mexico. She left after graduating high school to attend The Culinary Institute of America, Hyde Park. Subsequent to that, she obtained a degree in hospitality management from Florida International University. While there, she was one of the culinary coordinators for the South Beach Food and Wine Festival. Her kitchen experience includes training under Chef Jean George at Mercer Kitchen and La Lupita in London, England. Every meal starts with an amuse-bouche of beer battered house made pickles. They clearly learned something about soups from chef Gabe as the tomato soup with crisp mozzarella and basil mousse was full of delicious flavor. Housemade charcuterie, cheese and preserves. Ryan intends on pairing his cured meats with some imports in order to compare and contrast them. Current charcuterie being prepared in house are Beef Salami Cotto, Mexican Chorizo, German Hunters Sausage, Berkshire Bacon, Tasso Ham and Duck Prosciutto. Coming soon, hard salami, country hams, guanciale, pancetta, bresaola lamb bacon. They are also pulling their own mozzarella and manipulating most of their cheese either by hanging them or cold smoking. Also being prepared in house, Hoagie Rolls, Brioche Burger Buns, Apple Brioche for French Toast, Pullman Loaf, Rye, Focaccia, Pretzel and Tortillas. Tasso with strawberry jam (right) is dynamite and probably the best thing I've had there to date. Here it was plated with a very nice hunters sausage and blackberry mostarda. The hickory smoked salmon is another impressive dish. Ryan dry cures it for three to four days and then cold smokes it for two to three hours. It's served with mesclun, pickled onions, citrus dill creme fraiche and rye toast. I enjoyed the hot Italian sausage with peperonata onion compote, great crisp hand cut fries and Ryan's popular pickles. Ryan brines his pastrami for seven days and the hot smokes it for eight to ten hours. This results in a nice smokey flavor. It's on the lean side but great nonetheless. It's topped with pickled slaw and his hickory island dressing. The burger is a winner too. It's topped with Berkshire bacon, sharp cheddar, onion compote and hickory island dressing. I'm a bun snob and the lower bun unfortunately was unable to support the burger and fell apart along the way. Again, it's a housemade bun and obviously a work in progress. I expect it to improve over time. A pasta special one night consisted of lamb, grana padano, mascarpone and mint mezzalunas paired with turnips, onion and lamb yogurt. Sweetbreads with Jamon Iberico, charred peaches and a peach gastrique were an interesting combination that worked well for me. Meat fans will enjoy their hangar steak served with braised kale, cauliflower puree and white truffle demi. I've been able to speak with all three at some point during my vists and it is refreshing and exciting to see the passion they have about what they are doing and what they hope to achieve in the community. This is a gutsy young group that should continue to grow and improve. I'm looking forward to the ride. Go and give them a shot to win you over too. Sun: 10:00 am - 10:00 p.m.